Five years ago, Apple was a successful company with the iPod and its Mac line of computers. But it had not yet launched the iPhone. It had not yet launched the iPad. Back then, Apple’s yearly profit was $2.4 billion. In 2010 that number had risen to $16.6 billion. And in the first quarter of 2011, Apple has already made a $6 billion profit, well on its way to eclipsing previous years. It’s become a cash machine. Apple is riding a wave of continuous success, and the stock market simply loves it. The value of the company has skyrocketed. That’s the part we will take a closer look at in this article. 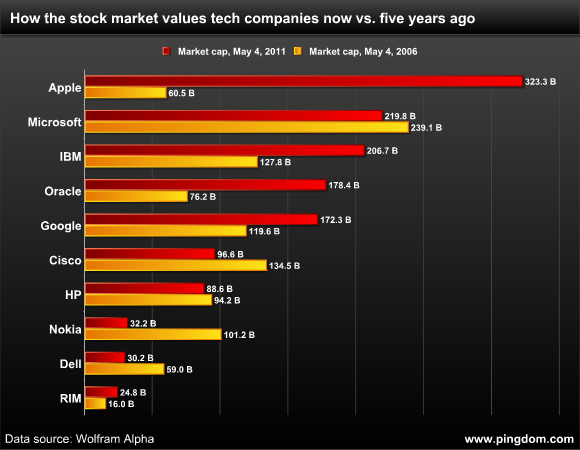 How well has Apple done compared with other big tech companies in the last five years, i.e. 2011 compared to 2006, the year before Apple launched the iPhone? To give you an idea of how much the value of Apple has increased in the last five years, we’re going to look at its market capitalization (“market cap”) and compare it with how some other big tech companies like Google and Microsoft have fared in the same time period. The companies are sorted by their current market cap, biggest at the top. As you can see in the above chart, none of the other companies we included even come close to the increase in market cap that Apple has seen over the past five years. This even though we included companies from all the different kinds of markets where Apple competes. Apple is now worth 5.3x more than in 2006. Google is now worth 1.4x more than in 2006. Microsoft is worth 8% less than it was in 2006. The biggest loser of this bunch? Nokia, which is now worth just 32% of what it was worth five years ago. When examining how the market cap has changed for these companies in the last five years, a couple of very interesting things stand out that give us a nice perspective on how fast Apple has grown compared to its competitors. In 2006, Google was worth twice as much as Apple. In 2011, they have traded places, with Apple now worth nearly twice as much as Google (1.9x to be exact). Another sign of how times have changed: In 2006, Microsoft was worth 4x as much as Apple. Now, Apple is worth 1.6x as much as Microsoft. That’s a pretty impressive track record. In just five years, the positions have completely changed. Apple’s revenue keeps growing, its profits keep growing, and it’s selling its products to an ever-growing user base. The incredible success of Apple’s iOS devices has helped pull the entire company up another notch (iOS devices now make up 65% of sales). So the company is definitely not running on fumes. It of course remains to be seen if Apple can keep this up, but for now, things are looking good. Now, if we had only bought a big lump of Apple shares back in the day… Sigh. A disclaimer: We here at Pingdom are techies, not financial analysts. If you make investments based on this article and end up losing money, don’t blame us. Data source: Market cap numbers from Wolfram Alpha. And all that based on one out-competed product, the iPhone. Apple will be the largest and fastest devaluation of wealth in this decade. Wow, just wow! They’re really big now. Apple is the new Evil Empire not MS or Ggl. Right, you see a product (iPhone), I see a platform (iOS). I don’t think I’ll care to spell out the difference nor the significance of that difference for you. However, I’ll invite you, or any one out there to spend a few moments to ponder that platform proposition, ere you may set your bet against Apple anew. Speaking of which, how many times now have we hard that ‘Apple is doomed’ prediction in the past decade alone? 3 words: stock value inflation. When that thing crashes I wonder how apple will twist out of that one. I know you guys are not financial analysts but market capitalization is a silly metric. Say if Apple has an antenna issue on a phone and the stock drops $10, does that really mean Apple is “worth” 9billion dollars less in a matter of days? Seriously. I have no doubt that AAPL will go up in price (although I was told that it should break $400 by May), but I do question if it is overvalued. Would it not have more long term value to compare turnover and profit instead of market cap ? @Savorique: Oh come on. Keep it clean, people, please. Apple made $14B last year. 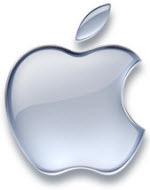 In this week’s Fortune 500 listing, Apple ranks #8 in profitability, #35 in sales. Why some people like Charbax, an Android astroturfer, and Shingetsu think Apple will crash is nonsensical. It’s already hugely undervalued based upon actual profits and growth rates. Apple has made over $12B in the first 6 months of this Fiscal Year. They are on track to make over $24B. That would put them 2nd in profitability on Forbes’ list. Ultimately, a stock’s worth is directly related to future profitability, and by all measures Apple’s present and future cash flows are huge and growing at an epic rate. Right now, only one other company in Fortune’s 500 listing is on track to earn more in profits than Apple this year, and that’s the world’s most valuable company, Exxon. I love how the haters have no actual fundamental reasons why Apple’s worth will go down. Good luck to you, but Apple shareholders will be laughing all the way to the bank. How do you figure IBM is worth 8% less than in 2006. The graph tells a very different story. @paul – you may e right but the figures for Apple would be even more outstanding. Must put my glasses on!